More trouble with Jackson. Last night he was chasing a fly in the hall and suddenly started screaming. It was a terrible sound…….as if he was in agony. I picked him up and put him on a sheet of newspaper as I thought he might be sick. He was gulping and swallowing. Then he was suddenly OK again. This morning when I let him out of his pen, I noticed one side of his face was soaking wet. I could not see where this wetness had come from. I telephoned the vet and she said it sounds like an overactive salivary gland. He could be allergic to the flies he catches or to something in the house. I am to take notes of what he has been doing when it happens. Not easy as I do not know when it is going to happen. He is fine at the moment but it is all rather worrying. Jackson fell into the bath last night. He was walking along the edge which was wet as I had splashed some water when getting in. Next thing, he was in the water with me! John fished him out. He seemed quite unperturbed and sat on the laundry basket staring at the water. He did not shake himself – just sat there dripping wet. Nothing much else to report. Not so hot here now. Back tomorrow. Today has not been very good. I hit a curb whilst driving to the town this morning and have scuffed one of my alloy wheels – not the new one I had last week. It has made a dent in one of the spokes of the wheel. It is not glaringly obvious but I am annoyed with myself. Then I decided to tidy the knitting needles and so took all of the boxes off the shelves and I tripped on the edge of a rug and they went flying and came out of the boxes and ended up in a gigantic heap! It took me ages to sort them all into lengths and sizes. We are going out for a drink now. I need one! Back tomorrow. I received a big box of new books today from Designer Yarns. 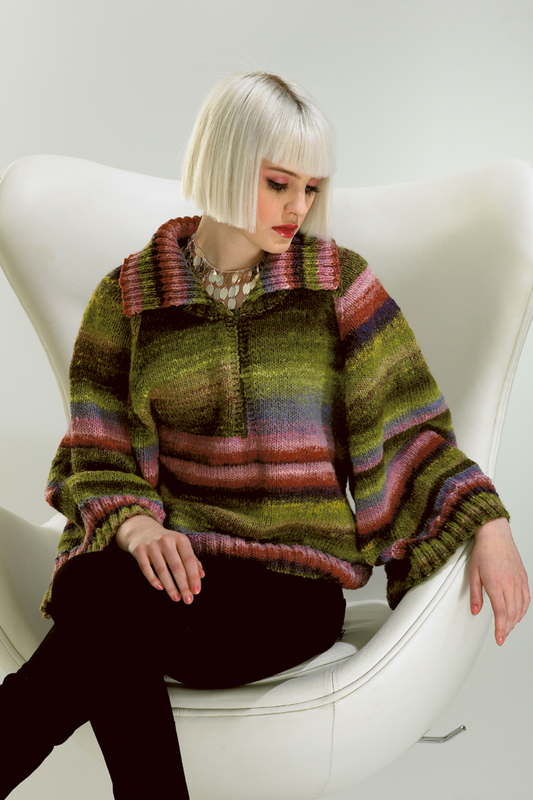 The titles are A Tweed Story, Glen, Folk Chic, Andes, Land Girl and Snow Queen from Debbie Bliss and Noro Style from Jenny Watson. Also in the box were two new shades of Silk Garden Sock and 4 new shades of Silk Garden. Jackson was VERY naughty yesterday. We let him out for his run in the garden and he promptly climbed a tall tree that borders my neighbour’s garden. He then jumped down into the neighbour’s garden. I had to run round from the back of our house, up our drive and then down our neighbour’s drive – it is some distance. Jackson was nowhere to be seen but I could hear him yelling! I eventually tracked him down – he was looking down one of the holes on my neighbour’s putting green!! He has not been sick for a week now and so I hope whatever it was has gone. Slip is in training for the start of the shooting season in September – it does not seem possible that shooting will soon be starting again! Now I am going to knit for a bit – I have nearly finished my Marion Foale sweater – it is far too big and I shall have to wear it as a tunic over leggings!! Back tomorrow. Today’s photos show Noro Kochoran which is being re-introduced this Fall. As you can see , there are eight colors and there will be a pattern book in support of the yarn. My new wheel has been fitted. And, no, I did not hit the curb to damage the old one! The roads here are full of pot holes and the garage said that was the most likely cause of the damage! When I went to collect the car it was parked in amongst an army of brand new Mercedes – I was very nervous backing it out and had visions of damaging these very expensive cars! The showroom is very swish – all glass and marble and there is even a bar where you can have a drink! I have just cooked one of the five salmon that John caught for Slip and Jackson’s dinner. We do not really like salmon and so I cook it for the animals. The main road that runs across the bottom of the lane where our house is has been closed due to a burst water main. I hope it is open tomorrow or else I shall have to do a detour along VERY narrow ( only one car wide) country lanes. Plus it is a very log way round – about 5 miles to get to the town, it is only 1 mile if the road is open. I am cooking Beef Provençal for dinner tonight. It is hard to know what to have everyday. Life would be much simpler if we could all just swallow a pill containing all the necessary nutrients! Off to pack the last parcels now before the postie comes! My Manos del Uruguay lace weight arrived today. It corms in hanks and so I have been twisting them into skeins. Not my favourite task. Jackson has not been sick for 3 days. I have now starting feeding adult as opposed to kitten food and, so far, so good. Tomorrow my car goes to have the new wheel fitted. The Mercedes garage always clean my car from top to toe. It comes back looking brand new. I have given up trying to obtain a new iPhone. I shall wait until the next one is introduced. By that time I will be out of contract and it will be less expensive to upgrade. Now I must let Jackson out for his evening run. It is me who ends up running after him luckily he yells all the time and so it is easy to track him down if he goes out of sight. I am sitting here waiting for John to telephone and say his flight has landed – then I am off to the airport. I am feeling very twitchy about driving there and hope I feel better once I am actually en route! I am cooking Beef Rendang. This is beef in a chilli and coconut sauce. I have never made this before and so I hope it turns out OK. For dessert I have made a Summer Pudding. Jackson has been a bad boy today. He has been leaping at Slip and digging his claws in – he does have these wild periods when he is uncontrollable. I must trim his claws again. He has also been sick again – we shall go to the vet tomorrow morning. I am off the hook!! John just called and I said that I was nervous about driving to the airport and so he suggested I call Steve and ask him to collect! I did so and he will go and get John!! To say I am relieved is an understatement!! My Beef Rendang looks a bit odd – I hope it is going to be OK! The sauce does not seem to have thickened as much as it should – maybe I will tinker with it! !